When you first start Backup4all the activation wizard window will be displayed. This will give you the option to purchase the program (if you haven't already done so), activate it (if you've already purchased a license) or start a free 30 day trial. After you purchase a license you will receive an email with your licensing information. 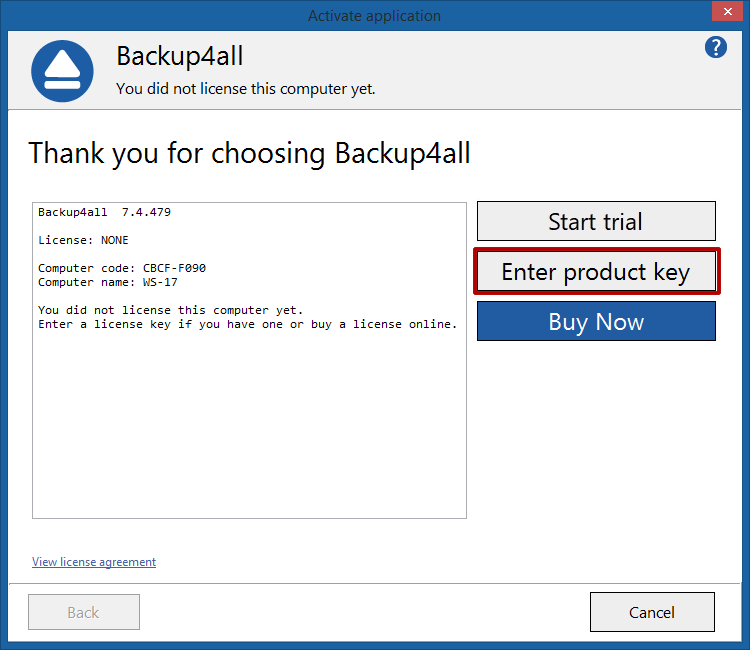 Using the product key received via email you can easily activate Backup4all automatically if your computer is connected to the Internet. During the activation process, your license key is verified online and after it is detected as valid you can start using Backup4all. If you don't have an Internet connection, you can activate Backup4all manually. Open Backup4all 7. 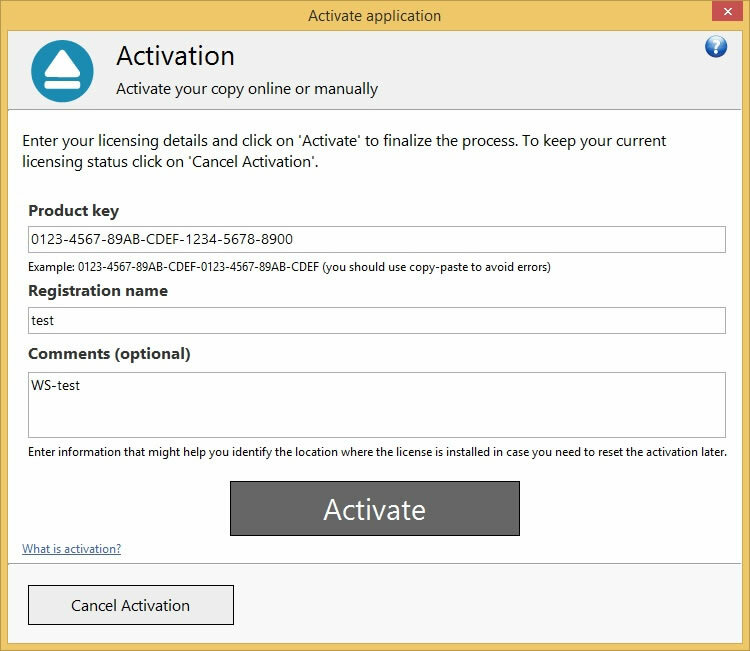 The Activate application window will appear and you need to press the Enter product key button. If you previously used the trial, you need to open the activation window from File -> Licensing, by pressing the Enter product key button. Backup4all also reactivates the license automatically every 30 days. If the main interface of Backup4all is not used at least one time a month, the reactivation will not be done automatically and any scheduled jobs running in the meantime will also stop running. Thus, if you do not want to open the main window at least once a month, you can create a scheduled task that will reactivate Backup4all 7 auotmatically. To create a scheduled task just open Control Panel and then click on Task Scheduler. Open Backup4all 6. The Activate application window will appear and you need to press Enter key button. If you previously used the trial, you need to open the activation window from File -> Licensing, by pressing the Enter product key button. 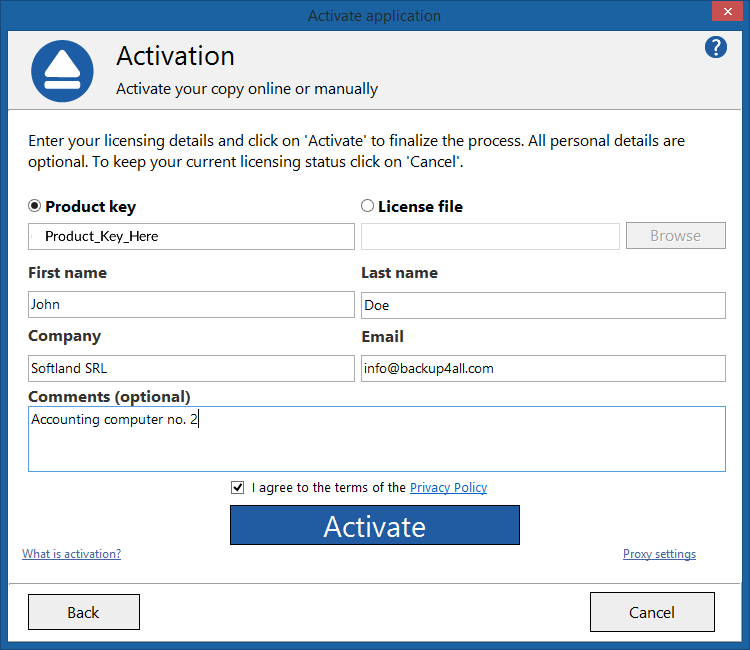 In the Activate application window, you need to enter the Product key received by email after purchasing Backup4all 6. For Registration name you can use any name you like (your name, company name, computer name and so on). Then press the Activate button. If the main interface of Backup4all is not used at least one time a month, the reactivation will not be done automatically. The scheduled jobs running in the meantime could be affected. That is why you should create a scheduled task for Backup4all 6 to run every month and just reactivate it. The task can be created in Control Panel -> Task Scheduler. Open Backup4all. The Activate application window will appear and you need to press Already bought button. If you previously used the trial, you need to open the activation window from File -> Help, by pressing the Enter product key button. 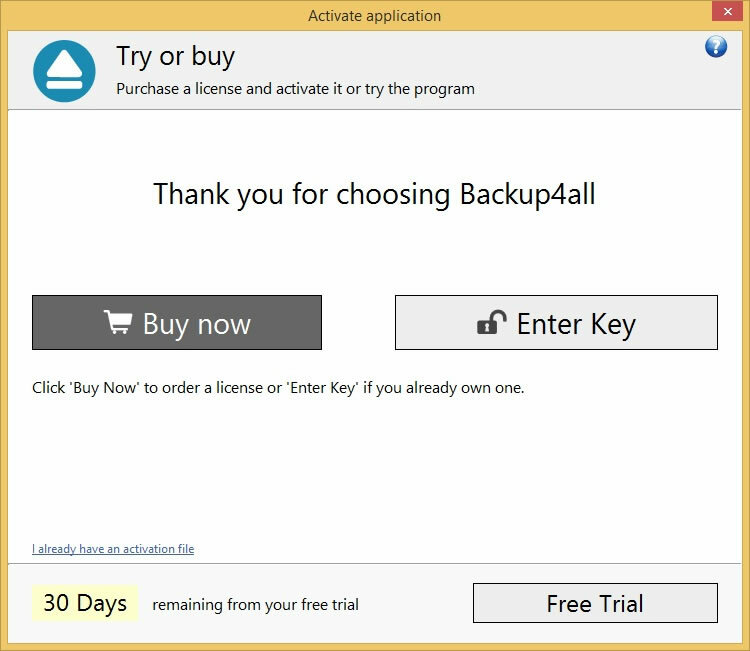 In the Activation window, you need to enter the Product key you received by email after purchasing Backup4all. For Registration name you can use any name you like (your name, company name, computer name and so on). Then press the Activate online button. If the main interface of Backup4all is not used at least one time a month, the reactivation will not be done automatically. The scheduled jobs running in the meantime could be affected. That is why you should create a scheduled task for Backup4all to run every month and just reactivate it. The task can be created in Control Panel -> Task Scheduler. 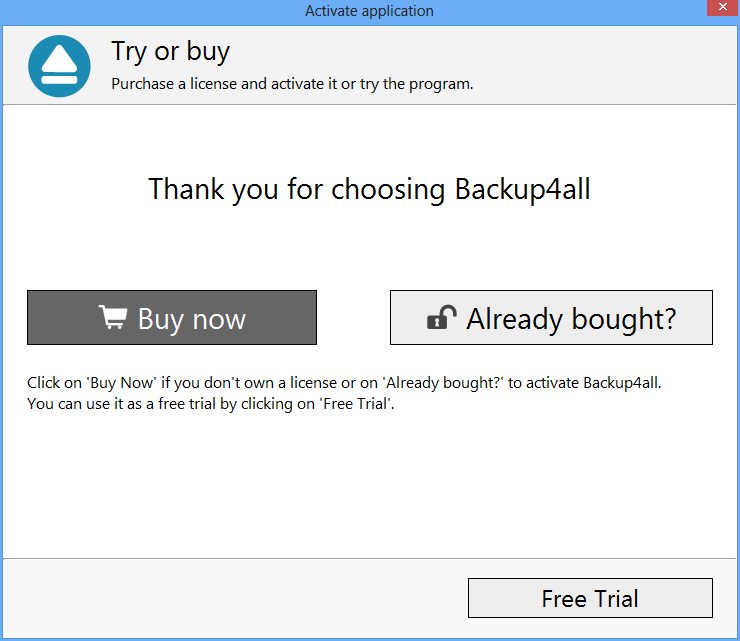 Backup4all needs to be activated after purchasing a license. If you have an active Internet connection the easiest way to activate Backup4all is automatically online. However, if you do not have an active Internet connection, this article describes how to manually activate Backup4all. The deactivation in Backup4all has to be done if you want to move the Backup4all license to another computer or if your computer crashed and you want to activate Backup4all on another computer. This section contains answers for frequent questions regarding the ordering process of Backup4all. How to use "Backup on demand"